But there’s a catch - the conversion costs more than a Model X.
Tesla has been tapping into a variety of different segments with its range of EVs. The Model S is a luxury electric sedan, while the Model X caters for SUV fans. A compact crossover is coming in the form of the Model Y in 2019. There’s even going to be a Tesla semi-truck. But there’s one segment Tesla has so far ignored: the shooting brake. To fill the void, companies have been working on their own Model S shooting brake conversions. One is but is still in development. UK carbon fiber specialist QWest has already beaten them to it, however, and . We’ve already seen it in photos but have yet to see it on the move – until now. In the latest episode of Fully Charged, QWest gives us a guided tour of the world’s first ever Tesla Model S shooting brake before the show's hosts take it for a test drive. During the drive, we learn several new details about the project. 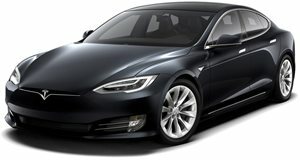 The modified Model S is 26.5 pounds lighter than the standard Model S thanks to extensive use of carbon fiber, some of which is visible when the tailgate is lifted. Rear seat headroom has also been improved by three inches thanks to the flat roof, while a panoramic window installed at the rear allows more light into the cabin. QWest claims the shooting brake should be more aerodynamic than the Model S sedan, too. QWest also revealed how much the conversion will cost for Model S owners wanting more cargo space. Unsurprisingly, it isn’t cheap. Prices start at $84,000 due to the extensive modifications required – that’s more than the cost of a new Model X. QWest may reduce the price if it gets enough orders, however. The conversion takes around 10 weeks and requires the owner’s Model S to be shipped to QWest's facility in Norfolk to have its surgery. It may be expensive, but you can’t fault QWest’s work here – the finished car looks like an official model rather than a conversion. Tesla was so impressed with the modifications, the original sedan’s warranty was upheld for the shooting brake.